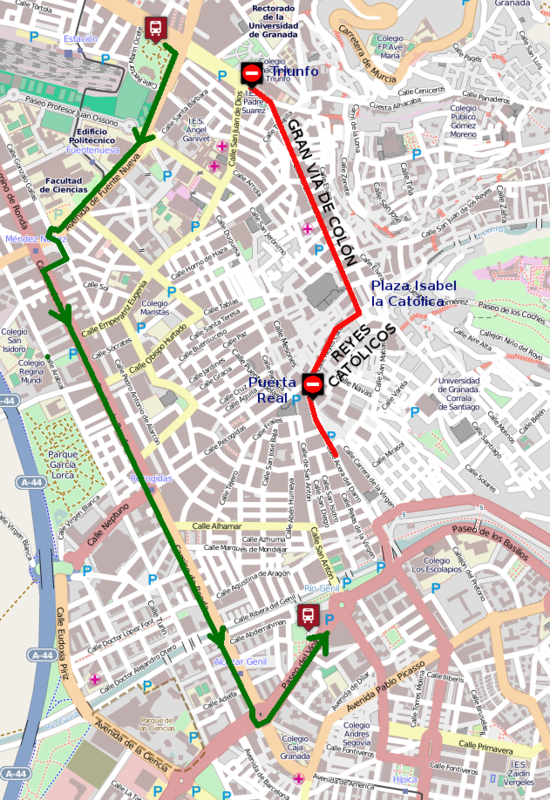 Public transport routes cuts in the City Center: Gran Vía, Reyes Católicos, Acera del Darro. Frecuent diversions, trouble hotspots, recommendations. 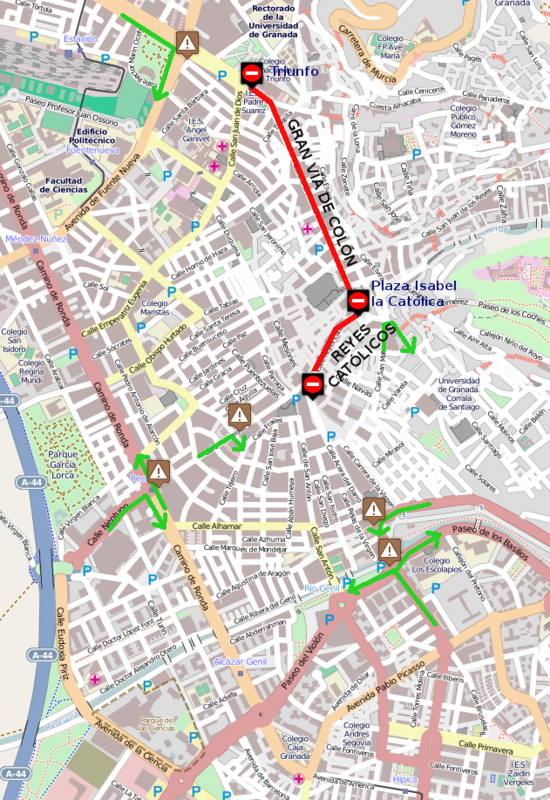 The main public transport axis in the city of Granada is maked up of these streets: Gran Vía de Colón - Reyes Católicos. 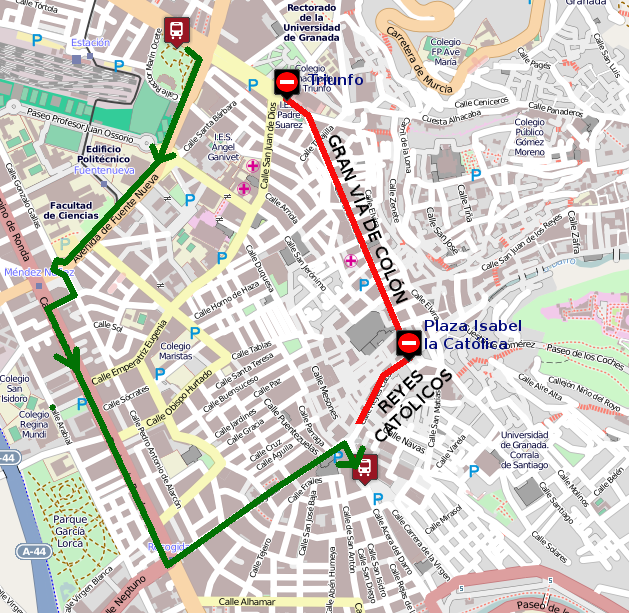 A very high number of urban bus lines circulate through these streets, so any traffic problem may affect the proper working of public transport. In the axis Gran Vía - Reyes Católicos - Puerta Real it is usual that religious or civic events may happen or demonstrations, and they have implied Gran Vía de Colón, Isabel la Católica Square, Reyes Católicos, Puerta Real and Acera del Darro traffic cuts. These kind of affections to mobility make public transport to modify their itineraries. Also, make diversions to private traffic through alternative ways so the accesses to the center won't blocked. These traffic diversions are made by the Local Police, allowing the access just for residents, public transport and emergencies. In this route, LAC vehicles stop in bus stops with no validation machines, so users must enter the bus only by front entrance, and they must use their bonobus inside the LAC vehicle or pay to the driver the single ticket. 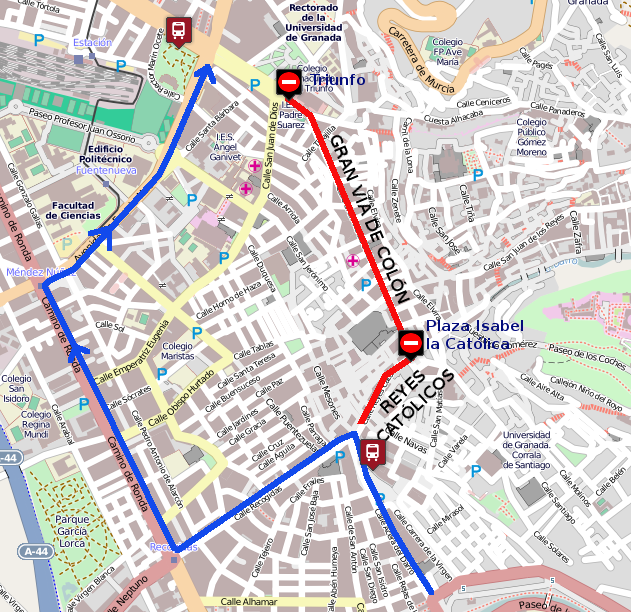 If traffic cut only affects Gran Vía - Reyes Católicos, minibuses from C1 and C2 (Albaicín and Sacromonte) lines modify their route using Elvira street. If traffic cut affects other streets, as at Easter, when Elvira or Carrera del Darro streets are closed, C1 and C2 lines start at Triunfo, going up Albaicín and Sacromonte by Murcia road, and even may not work.